Computer search tools are very powerful. It is relatively easy to search all the digital files on your hard drive for specific key words or phrases. Newer scanners with OCR (Optical Character Recognition/Reader) allow you to search pdf documents as well. Strong search capabilities allow you to design a fairly flat folder hierarchy with fewer subfolders. However, the best tool to finding files quickly is a strong naming convention. A naming convention is a standardized system for labelling your digital documents. (I’m using documents broadly to include spreadsheets, pdfs and photos.) A strong naming convention makes it easy to name and retrieve documents. Like folder names, your naming convention must make sense. There is no perfect system. Use words, phrases and abbreviations that mean something to you. Once you have decided how you are going to name files going forward, make a note in a README document to explain the convention and any abbreviations or codes you are using. Make sure everyone who accesses the files knows the system or where to find it. The name needs to be indicative of the contents. If it refers to a project, use the project name or an abbreviation. If there is a topic, include that in the name. Make sure you indicate what type of document it is – statement, newsletter, agenda, report, form, template, article, blog post, minutes, etc. Don’t try to be all-encompassing with the file name. It becomes unwieldy. The name should be short, but meaningful. Use initials and abbreviations if clear. For example, if you are referring to a city, use the standardized airport code for that city. Don’t use special characters in your file name. Some software and search functions won’t even recognize spaces. To delimit words, topics, and dates, use underscore, dash or camelcase (using upper and lower case) or no spaces at all. It’s important to use a date in the file name. The date attached to a document is the “Date Modified.” Every time you make an edit or change, the date changes. Always use the date format: YYYY-MM-DD. Order your fields from general to specific. If chronology is important, put the date first. If chronology is less important, put the topic first. You want your files to be naturally ordered according to the type of file. If you include people (author, reviewer, recipient, etc) decide on a format for names. A standard format would be surname then first initial. Alternately, you could use the first three letters of the surname and the first three letters of the first name to keep all names a standard length. I would be SmiCyn. Treat your images as you would any document. Use folders, sub-folders and name each image. 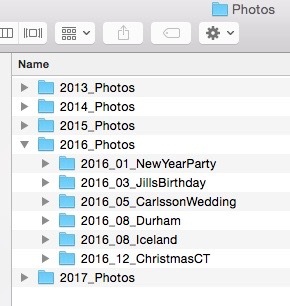 You can set up folders by year, sub folders by month or event, then name each image. For example, images in the “2016_08_Durham” folder would include photos of Hadrian’s Wall, of the cathedral, and of Lindisfarne Island. If there are multiple images of Cynthia at Hadrian’s Wall, add a number to the end (01, 02, 03). As you edit and winnow the raw images, save them with a name. Then you know that the named photos are the ones to keep. Don’t worry about your backlog. Start your naming convention going forward. You can work on the older files as you have time, deleting or archiving those you no longer need. Below is a folder of meeting agendas and minutes using inconsistent file names. When sorted by name, it is difficult to find the document you need. Below is an example of a consistent naming convention. For board meeting minutes, the most important piece of information is the date. Next, the name of the group and last, what kind of file it is.